Bellecombe site –Sipibel– was created in 2011 in order to study the characterisation, treatability and impacts of hospital effluents in a urban sewage treatment plant. ‐ receiving waters, the Arve river. ‐ the RILACT project (Risks and Measures related to pharmaceutical, detergent and biocide discharges in hospital and urban effluents) which started in November 2014 in response to the "Innovation and change in practices: micropollutants in urban water" national call for projects. which aims to monitor effluents and their impacts on receiving waters, for a minimum period of 3 years following the opening of the hospital, with data banking. with: a website, scientific publications, conferences and press conferences. 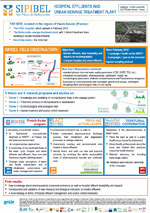 The Bellecombe “Syndicat" (managing the sewage treatment plant) and the Alpes Léman Hospital (CHAL) have associated with the Graie, The Rhone-Alps Group of Research on the Infrastructures and Water, to put together a group of specialised scientists, stakeholders of the territory and institutionnal partners.